Home » Pregnancy • TTC & Pregnancy » More Nursery Decorating! Butterflies, flowers, ladybugs, and… snails? Yep. Snails! This morning I decided to tackle a little more decorating. 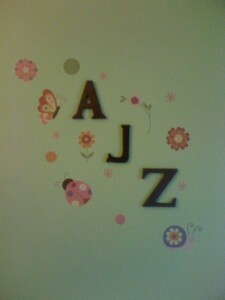 Last weekend, Brian hung the wooden letters for babygirl's initials. Yesterday we went to Babies R Us to update some registry items (the stroller I originally selected was discontinued and we're not ready to buy one). I picked up a photo frame that I've been eyeing for awhile (holds 3 ultrasound pictures, one for each trimester) and also found some cute adhesive wall decals. I was pretty excited about the wall decals. We had spotted some at Home Depot a couple weeks ago, but they were really large shapes. I was tempted by the flowers. While at Babies R Us, I was checking out crib bedding to add some girly themes to the registry when I spotted canvas wall art and then the decals. Oh so many to choose from! But I love the concept – stick 'em up. If you stick 'em wrong, just peel off and do it again. If she turns out to be a he (we're quite confident she's a she, but there's no 100% guarantee until she's born…) then I can peel 'em off, save 'em, and buy different ones. No repainting necessary. Same for when she's older and wants to redecorate… we can check out different stickers and not necessarily repaint the whole room. At first, I thought the price of the adhesive decals was a bit pricey. I paid $20, but I didn't quite realize how large they were or that there are 4 sheets of stickers. What you see in the above picture is only 1 sheet of stickers used. (Well, 1 sheet plus 1 sticker from another sheet to be completely honest.) So now I'm feeling better about the cost – so worth it! 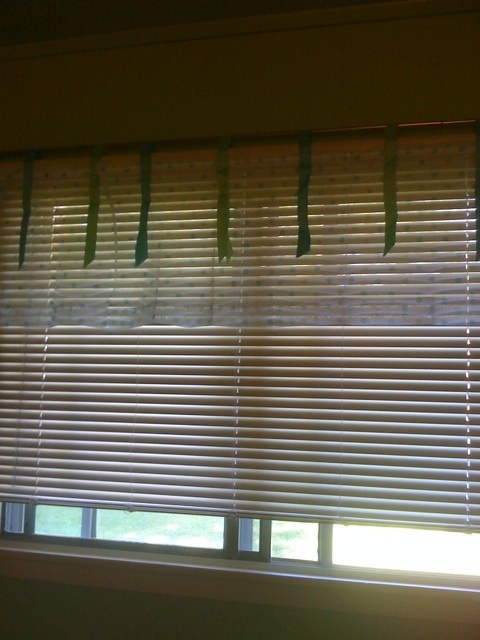 The other bit of decorating that was accomplished last weekend was adding a valance over the mini-blinds. We (read: I picked out and hubby installed) also changed our living room curtains and rod. 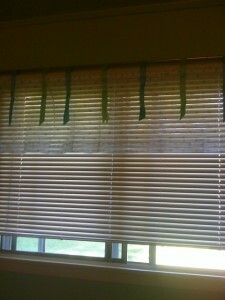 The valance is pretty light, so it may be hard to see the blue and green dots on it. I liked the ribbons for hanging it – made it feel more kidsy. Now… to get the final big pieces of furniture (crib and changing table) so I can figure out how to arrange the room to my liking while keeping in mind safety for baby. Looks good. I should do something on the wall above poor bub’s change table or something here. Savannah’s room was completely done in a jungle theme and looks great, but bubs #2 has been a bit neglected lol. Oh yeah, and don’t worry about arranging the room to your liking… you’ll change it 100 times before bubs is out LOL! 1. I like the new layout and colors! 2. I like the wall decals a lot! Etsy.com has a TON of wall decals as well that I’ve been keeping an eye on for various rooms and things. I love that its like you said, you can just peel them off and redecorate later…which is a huge plus for growing kids!